If you need to check what version of SharePoint server your Office 365 tenant is running especially during the Office 365 and SharePoint Online service upgrade (aside from checking through the Admin Portal via https://portal.microsoftonline.com) then you can add the following /_vti_pvt/service.cnf to the end of your SharePoint site – as shown below. 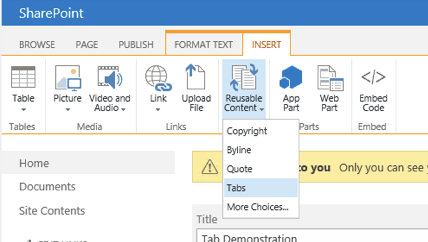 The page will output two lines of text from which we can determine the version of the SharePoint servers. If the second row starts with 14 then you are running SharePoint 2010, if it starts with 15 then you are running SharePoint 2013. 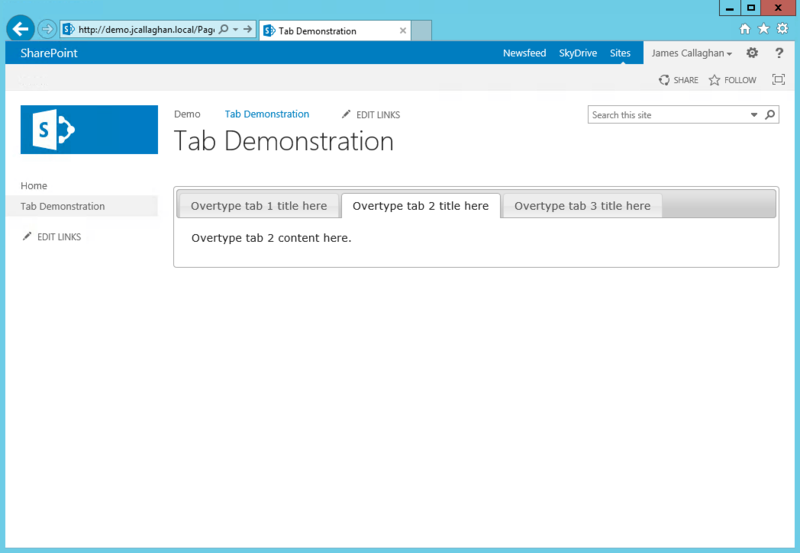 After the service upgrade you may be running SharePoint 2010 on SharePoint 2013 servers (technically known as 14 mode) until you upgrade your site collections to SharePoint 2013 (15 mode). This morning I was trying to create a new style in the itemstyle.xsl stylesheet to use within the content query web part (CQWP). I needed a custom style to display a list of announcements, some of which had content and others didn’t and this style was to improve this output. The problem is that the ‘Body’ column of an announcement or more importantly the ‘rich text’ field type is never really empty. Even when the column genuinely empty and has no rich text content, a hidden html element (a div) exists and acts as a wrapper for any content. As a result, if you try and use a typical ‘if equals null’ statement to hide the rich text column it won’t work because of this hidden element. 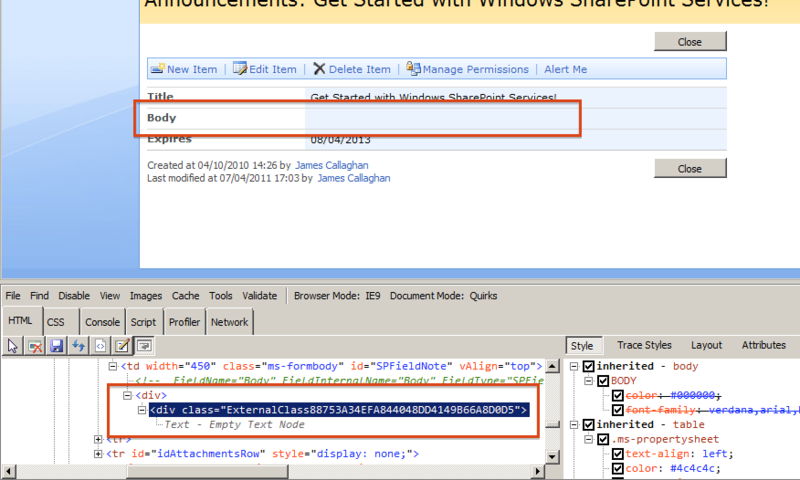 An empty rich text column on SharePoint 2010 always has 37 characters as shown below. 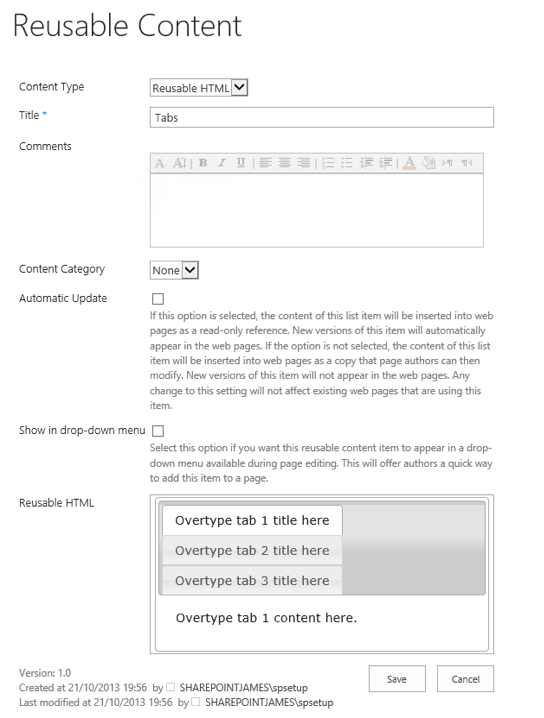 With SharePoint 2007 the rich text column has 65 characters when empty, again as shown below. 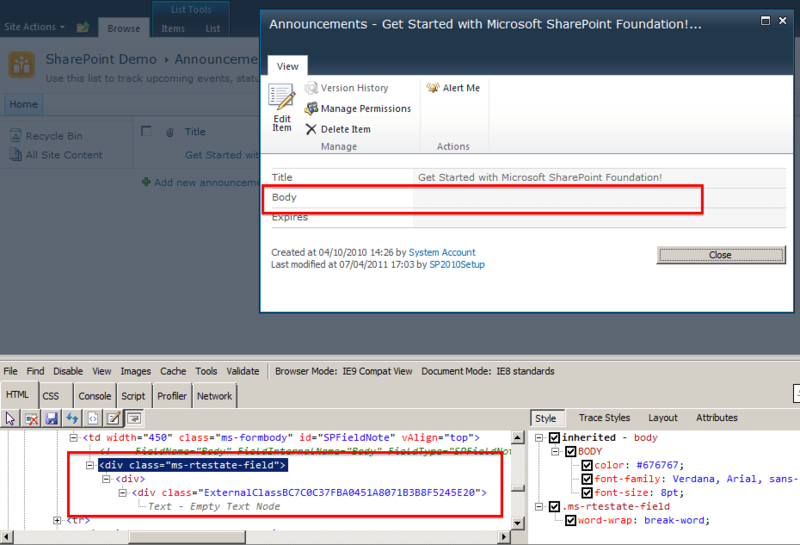 The solution in the end was to use the string-length function to determine if the rich text column was longer than the standard 37 characters on SharePoint 2010 as identified above.